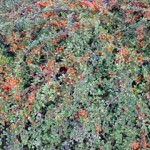 A wide spreading, low growing shrub with stiff branches and small shiny, dark green leaves. Flowers are pinkish-white, followed with red berries in the late summer and fall. Foliage turns bronzy-red in the fall. It prefers moist, well-drained soils, but is tolerant of poor, even compacted soils. It grows best in full sun. 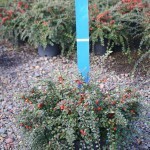 Useful for growing on banks, for foundation planting, and general ground cover.